Whoever heard of a one-man track team? If you haven’t, meet Kermit Perry. If you were at Atlanta’s Grady Stadium in the spring of 1951 you could have seen him run the high and low hurdles, 220-yard dash, high jump, long jump, pole vault and throw the discus. He won every event, and that doesn’t include his 220-yard sprint on the championship relay team. Cedartown High, with Perry at the helm, whitewashed O’Keefe High in a dual meet. Perry’s teammates were in such awe of him they elected him team captain, not just of the track team but of the football and basketball teams as well – he was equally skilled in all three sports. He played defensive and offensive end on the football team and there wasn’t a better one in the region. Though he weighed a mere 160 pounds Perry had the heart of a giant. That quality is what attracted University of Georgia football coach Wally Butts, who wasted no time in signing Perry to a grant-in-aid. At UGA, two knee operations and 14 shoulder dislocations shortened his football career. But nothing could stop or even slow down this speedster in track. Maybe it was because he grew up on the horse track, but watching him on the cinders at UGA was like watching a mix of War Admiral and Whirlaway. And there wasn’t a high jumper in his class until super frog Leman (Buzzy) Rosenberg came along some 20 years later. For three consecutive years Perry was undefeated and for three consecutive years he was named to the All-Southeastern Conference team. Twice he was selected team captain. Perry credits his success on the college track to his coach, the late Forest (Spec) Towns. “He never missed a day telling me I could be better than I was,” Perry says, “that I had the heart of a champion and that I was going to beat every hurdler in the conference. Perry grew up in Cedartown, son of Elbert and Clara Perry. His dad quit school at age 8 to work in a cotton mill and later became a superintendent of a Goodyear plant. His mother worked in a clothing store downtown. He received his bachelor’s degree in education from UGA in 1956 and earned a master’s degree from Peabody College in 1960. In between, he served six months of active duty with the U.S. Army. He also won the high hurdles at the Sugar Bowl Invitational, set a hurdles record at the Fort Benning Invitational and was chosen to the Third Army All-Star team. Think Perry was just another outstanding jock? Think again. He was a fixture on the Dean’s List. He was also in the Gridiron Society, Sphinx, Blue Key, a distinguished ROTC student, company commander of the ROTC and the number one cadet in his class at summer camp. Today, Perry, 73, lives with his wife of 25 years – the former Betsy Haavie – in Newnan. 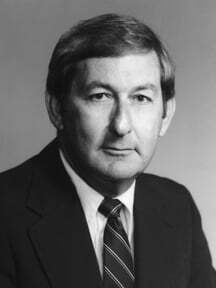 He originally moved to Newnan in 1964 to become executive director of the YMCA and left seven years later to become business manager of athletics and assistant AD at UGA. Seven years later he moved again for a seven-year stint as assistant AD at Auburn. He also led football, basketball and track teams at various high schools around the state to winning seasons before retiring four years ago.